Here is the more or less completed version of The Annunciation. It is charcoal and acrylic paint on a 24X30 lauan panel. 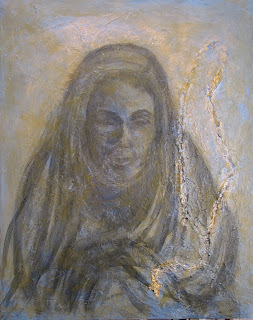 A cord rosary has been pressed into a thick layer of gesso to leave its impression in the painting. This is a rough study for a painting of the Annunciation that I am beginning. The idea is to portray the moment that the Blessed Mother accepts the responsibility for concieving, giving birth to and raising our Savior. I intend to keep the image loose with the original charcoal sketch visible over the glazing. 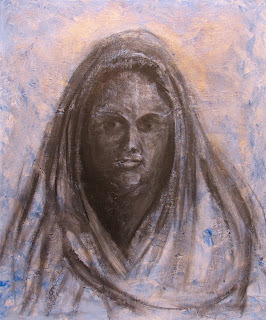 This is a project that I discussed in an earlier blog entry; to execute a series of paintings that portray the Mysteries of the Rosary in a way that will help the viewer meditate on each Mystery.